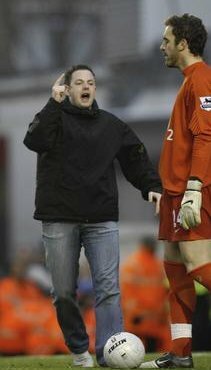 The former Royal Engineer jumped out of an Arsenal section and ran onto the pitch and headed towards Almunia who was defending the Clock End. He 'Ayatollah'd' on his way towards the Arsenal keeper before being taken away by stewards and police. French now faces a three year ban from all football grounds and possibly a jail sentence. 'No-one stopped me getting on the pitch.